Whilst gold and silver normally correlate closely, last week was an encouraging one for the price of silver which continued to ease higher, in contrast to gold prices, which stalled and moved sideways for much of the week. Friday’s candle on the daily silver chart closed the week in positive mood, with a narrow spread up bar, and penetrating and holding deep into the resistance level below the $14 per ounce level, which is now on the horizon. 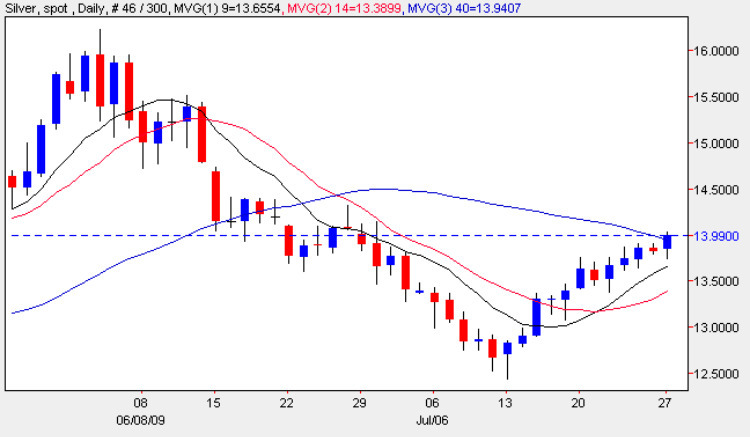 With the gap now closing between the current price and the 40 day moving average, we need to see a break and hold above this key technical indicator which will then provide us with a degree of comfort as we look for silver prices to push higher this week. As with gold, silver prices will also be boosted by ongoing dollar weakness (which shows little sign of abating) and, as an industrial metal, silver should also benefit from a buoyant and positive equity market. However, for any sustained longer term rally we do need to see a break and hold above the $14.50 per ounce level which would confirm that the bullish tone is firmly established once again.